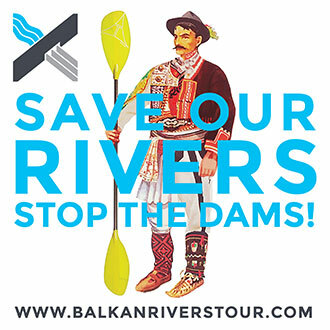 The Balkan Rivers Tour has become the biggest rivers conservation action in Europe and, simply put, exists because of three people; Ben Webb, Rok Rozman and Anka Makovec. The connection between these three people – who are fighting for free flowing rivers in three different continents – is a story of coincidences and fate, and maybe something more. Rok started the Balkan Rivers Tour after meeting Aussie Ben Webb by chance on the streets of Pucon, Chile in 2014. While kayaking in Peru, Benny heard about plans to dam one of the sources of the Amazon, the Rio Maranon, and started a campaign against that. His inspiration to do something this crazy came from a previous paddling trip on the Franklin River in Tasmania. The Franklin River was and still is one of the biggest stories of success when it comes to defending a river against a big dam – in the 80s they fought the dam and won! While Ben paddled the Franklin he found a stunning text in a logbook at the end of the run about the conservation movement. This river and these words evoked so much emotion that he promised to save one river in his lifetime, no matter what. Rok started saving the rivers of the Balkans because he was inspired by Ben…who was saving the Maranon River, who was inspired by Anka…who was saving the Franklin River. From Eastern Europe to Peru to Tasmania, these three people are making a huge difference in river conservation worldwide and we want to bring them all together. But we need your help to raise money to get Rok and Ben to meet Anka and the Franklin in Tasmania. When Rok returned home to Slovenia he had plans to return to Peru to help Ben. But just moments before booking the flight he came across information that there were plans to build 2,700 dams in his backyard – the Balkan Peninsula. This is how Balkan Rivers Tour was born. As the tour progressed and gained momentum, Rok discovered that the Franklin river protests were started by a lady named Anka who is also Slovenian. At the following BRT presentations Rok was connected to Anka’s nephew and eventually Anka herself who is 78 and living in Tasmania.